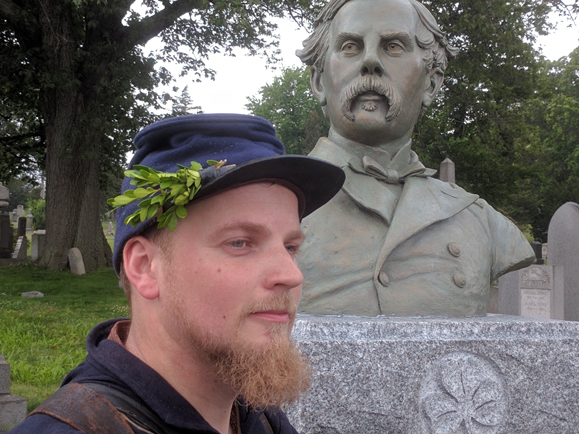 Pictured below at the dedication of a new monument to General Thomas Francis Meagher at Brooklyn’s Green-Wood Cemetery in July is Jessie Meagher, great, great grandnephew to Meagher, stands next to a newly unveiled bust of his relative. Jessie is dressed as a soldier in the 69th New York 1st Irish Brigade, which Meagher commanded. He had a sprig of boxwood in his hat to recall General Meagher’s distribution of the greenery before Fredericksburg.